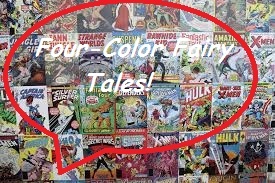 Fairy Tale Fandom: Four-Color Fairy Tales: Pinocchio, Vampire Slayer. Four-Color Fairy Tales: Pinocchio, Vampire Slayer. Here it is, folks. One of the comics that this blog was practically made to review. You know that none of the other fairy tale bloggers would touch a concept like this one. Tales of Faerie? Amy Elize? Sur La Lune? I love all their blogs and think they do good work, but there are some concepts that are so bizarre sounding that only the Fairy Tale Geek should tackle them. This is Pinocchio, Vampire Slayer! Published by Slave Labor Graphics Publishing with writing and art by Van Jensen and Dusty Higgins. And I still haven’t put it away with the other Christmas decorations! So, what’s the deal with a comic entitled Pinocchio, Vampire Slayer? Well, the story takes place after the events of the original book. And I do mean that. Many people aren’t fond of Collodi’s original text, finding it too dark or too didactic to really enjoy. Many people simply embrace the basic idea of a puppet coming to life and ditch a lot of the rest. The comic’s creators embrace Collodi’s original on a level few others have. The characters routinely drop references to events in that book. Each of the two volumes I’ve read have started out with a recap of the original story. There’s only one important part of the book that never happened in this version: Pinocchio never became a real boy. In this case, that’s not only important but a very good thing. Pinocchio’s home town of Nasolungo has been beset by a vampiric plague. 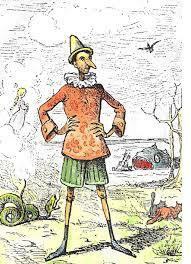 It has gotten so serious that even Pinocchio’s dear father Geppetto has fallen prey to it. Seeking to avenge his father, Pinocchio finds that the wood he’s made of is uniquely effective at killing vampires. His preferred method is to tell a lie and then snap off his lengthened nose and use it as a stake to stab vampires in the heart. In the first volume that I read, Pinocchio is joined in his quest by Mr. Cherry the carpenter, the Blue Fairy and the ghost of the Talking Cricket. We’re also introduced to a new character named Carlotta that Pinocchio seems to have a bit of a crush on. After a particularly harrowing ordeal defeating the vampires in his home town, Pinocchio sets off on a journey to hunt down and kill vampires in the wider world. In the second volume his quest continues but he’s joined by the performers of The Great Puppet Theater who do well to round out the cast. Those are the only volumes I’ve read but I know there are more out there and I’ll probably be seeking them out. The story is well-paced. The writing is good, combining humor, scares and genuine emotion. The art is this great, moody, black-and-white affair that has lots of spooky shadows but enough genuine cartooning in it to keep it from getting too serious. It’s really just a very well-made comic book. But most important of all: it works. Adding a gothic horror element like vampires to an existing fantasy concept is something that could easily fall flat. For example, I once saw a version of the Sleeping Beauty ballet that replaced the standard fairies with vampiric fairies. The end result just really didn’t work for me. This works for me. And it works because the original book was just so weird to begin with. I don’t know if I’ve made this comparison before here on the blog but Collodi’s original Pinocchio has a bit more in common with books like Alice’s Adventures in Wonderland and the various Oz books in terms of what crazy concepts it embraces than your standard fairy tale. There’s a strange randomness to Collodi’s book. Pinocchio is originally made from a block of wood that talks by itself, puppets exist as living beings with no explanation, giant dogfish swim the seas and characters that died in previous chapters reappear randomly in different forms. Most people don’t realize how odd the book was because they’re more aware of the Disney version and I won’t lie, Walt grounded the hell out of that picture. Just making Pinocchio’s life a product of the Blue Fairy’s magic did a lot to turn a somewhat surreal fantasy into a standard fairy tale type of story. As fantastical as the Disney version is, it’s not a patch on the sheer fantastic craziness of the original source. So, given the bizarre nature of the world Pinocchio already inhabits, adding vampires to the mix doesn’t seem like such a stretch. And the creators of the comic prepare you for that at the beginning of each volume by recapping the original book. This comic gets a passing grade from me. I know people will probably give it a pass just based on the title and concept, but it’s really very good. So, if you see it at the bookstore or local library and you’re unsure, take a leap and get it. This might prove to be just the comic you want to sink your teeth into. Scooped me again, Gypsy! But then you always seemed to be more up to date on this stuff while I tend to do more retro reviews.